Transitions of care occur when patients move from one care setting to another, such as from hospital to home, hospital to skilled nursing facility or rehabilitation facility to home. Many errors that harm patients and lead to costly and unnecessary readmissions occur during care transitions, particularly errors involving medication and lapses in care. It’s estimated that 75 percent of hospital readmissions are avoidable and result in approximately $44 billion in annual wasteful healthcare spending. 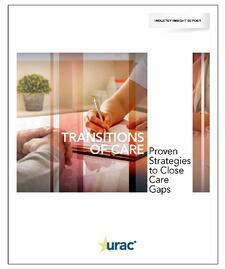 Discover the successful transitions of care processes that healthcare providers and health plans have refined to address the primary causes of avoidable complications and readmissions, in this Industry Insight Report. Geisinger Health Plan reduced the average 30-day readmission rate among patients discharged after a short nursing stay to just 15 percent, well below the national average of 25 percent. Tallahassee Memorial Transition center has reduced unnecessary emergency room visits and hospital readmissions by 68 percent, saving hospitals up to $1 million annually. University of Chicago Medical Center is piloting a Comprehensive Care Physician (CCP) model, placing PCPs who speciallize in treating patients at high risks for readmission directly in the hospital to round with the inpatient care team. Download your free Industry Insight Report today by completing the form. For information about URAC's accreditation programs, call us at 202-326-3943, or email businessdevelopment@urac.org. Your privacy is important to us. URAC never shares, sells, or rents any information that you provide. Your email will only be used by URAC to provide you with relevant offers or to contact you if you have requested it. All emails that you receive from URAC provide a link at the bottom to allow you to opt-out of receiving emails at any time.